Our Neighbor down the road. 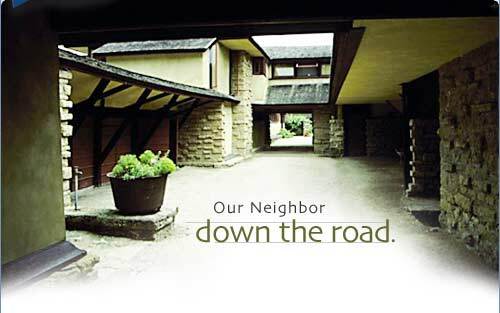 Lands' End Newsletters | Our Neighbor down the road. There's always one neighbor who's the talk of the neighborhood. In the part of Wisconsin Lands' End calls home, one neighbor casts a pretty big shadow. He's also a certifiable genius. Just up the road from our Dodgeville homeplace is Taliesin, the home and studio of Frank Lloyd Wright. And you can take a tour. Taliesin was Mr. Wright's masterwork of organic architecture, a special relationship he sought between structure and the surrounding countryside. Out here among the rolling green Wisconsin hills - a spot Mr. Wright considered one of the prettiest in America - the sweeping constructions of locally quarried stone have the look of something sprung from the earth. Now, every structure on the tour has a story. And the gist of all the stories is that Frank Lloyd Wright was a genius, that his ideas were too advanced for a world that wasn't ready, but that time has proved him right. Take the story of "Romeo and Juliet." "Romeo and Juliet" is a stone windmill tower built of two interlocking structures - Romeo (lozenge cross-section, facing windward) and Juliet (octagonal cross-section, facing leeward). Now, according to the tourguides, the locals saw this and guffawed. "First big wind and down she'll come," they scoffed. But, of course, Mr. Wright knew better. Hse'd cleverly engineered the structure so that Romeo's windward edge formed an airfoil that caused a zone of positive air pressure to build on the leeward side, pressing "Juliet" firmly against "Romeo." In this supporting "embrace," they propped each other up - something like a tipsy couple at a dance. Thereafter, whenever it stormed, Mr. Wright would race outside. It wasn't to see his towers come down - he knew how well he'd built them - but to amuse himself at the sight of all the eager naysayers gathered on their porches to witness the disaster that would never come. Now, like the prophet who receives no honor in his own country, Mr. Wright had his detractors, too. And the detractors had stories of their own. The gist of these is that Mr. Wright didn't like to pay his bills. In fact, it used to be said that if you threw a party for everyone he owed money to - well, it would be one heck of a shindig. True or not, these stories have grown up into a body of local folklore. Here's an example. Having been turned away with a laundry list of excuses - "Mr. Wright is busy in his studio, Mr. Wright is meeting important people, Mr. Wright is taking a nap" - one exasperated creditor collected his arrears at the point of a gun. Retribution was swift. The gun-toting creditor soon found himself before a judge. "I understand your feelings," the judge told him. "He even owns money to the county, but you don't see us waving guns in the gentleman's face, do you?" "Well, judge," the prisoner replied, "I got my money - did you get yours?" Another story involves a creditor who was finally paid after ten years of being patient. Handing over the check, or so the story goes, Mr. Wright confided, "If you're smart, you'll hold onto this. I'm going to be famous one day and that signature will be very valuable." The lumberman, we're told, headed straight for the bank. But, as the tourguides remind us with the stories they tell, it was one more occasion that proves Mr. Wright had a prescient mind. Spring/Summer Women's 18W-26W Collection is Here! Sized and proportioned to fit and flatter fuller figures, the LANDS' END WOMEN'S 18W-26W COLLECTION features all our most popular basics - including what might be the best-fitting DENIM JEANS you've ever worn. And rest assured - everything is made with our usual Lands' End attention to quality, detail and value. Or for the farthest green, at least. This GOLF POLO marries a touch of Lycra® spandex to a cool piqué cotton knit for a Polo that won't get in the way of your golf game. All the breezy benefits of pure cotton mesh translate beautifully into this knee-length TIPPED POLO DRESS. Sporty tipping at the collar and banded cuffs add a dash of panache. A Polo in a class of its own. 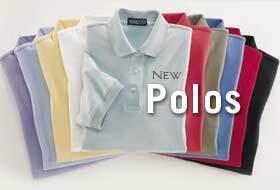 The stand-out feature of this WOVEN COLLAR STRIPE PIMA POLO is the bold addition of a woven twill buttondown collar to the 100% cotton knit shirt. In fact, you could even wear it with a tie - but you probably shouldn't. The blissful combination of sleeveless styling and the airy cotton piqué knit makes our JOHNNY COLLAR POLO DRESS a study in cool. It's the next best thing to equipping your girl with a personal air conditioner! The ring-spun combed cotton 5-oz.jersey knit used for our KNIT SHEETS is smoother, stronger and more durable than the "T-shirt" knits you're likely to find in stores. It's softer than percale, cooler than flannel, and they don't need ironing. How's that for a dream fabric?.